Choosing rhododendrons can be a hard task. Unless you are prepared with the right information about the king of shrubs and know exactly which one is the best for you, you may face some serious trouble during your shopping. The experts at Derwen Wholesale have compiled this guide to help you get started. To most gardeners, the rhododendron bush is the most beautiful. Each variety of rhododendron blooms in a myriad of colours and styles and the scented ones provide an aromatic setting in the garden that is also quite visually pleasing. The leaves of the rhododendron shrub can be as small as a fingernail and as big as half a metre. They can also be chartreuse, greyish-blue, maroon, or variegated, or have grey or orange undersides. The rhododendron bush prefers shade, but there are varieties that can grow in full sun. They can be available in different growth sizes, from dwarf and low growing to medium growing and tall. Not all rhododendrons are the same. Just as not all homeowners are the same. 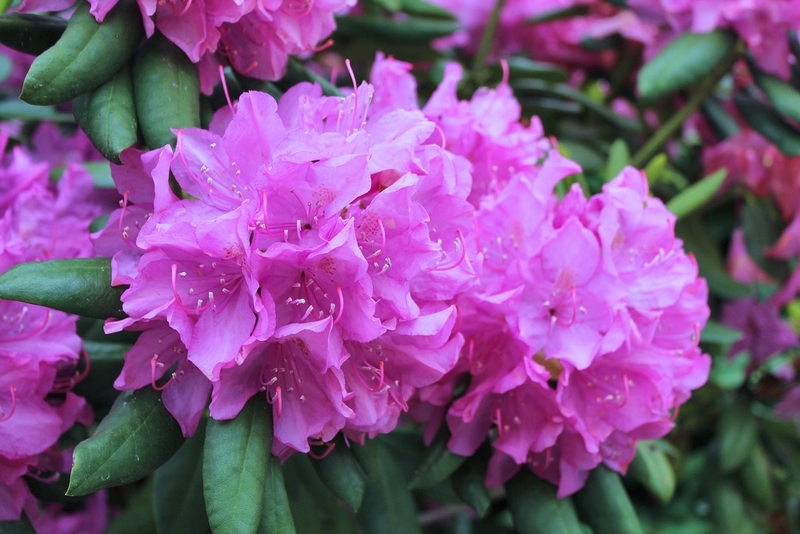 It is important to understand that the variations of the rhododendron plant should be considered carefully before the installation so that the right shrub is planted in the right place. For instance, many homeowners who may have planted rhododendrons without much research may find that they have planted the tall growing one right outside their window instead of the dwarf or low growing one, and now have to keep pruning continuously or take it out. Or plant a rhododendron shrub in full sunlight when it prefers shade or vice versa. It is essential to conduct research before choosing the rhododendron plant so that when you finally buy the chosen variety, you know exactly where to plant it and how to take care of it. A group within the rhododendron species is known as “azalea”. Most of these plants are deciduous although some are evergreen. Choosing the right rhododendron can be a difficult and confusing job, when you have so many types of the shrub in front of you. But with the help of professionals, you can make the right choice. Please call us today at (01938) 553015 or send us a message here so that we can help you choose the best rhododendron for your needs and budget. Choose the rhododendron you like best from our inventory and place the order today!